Like Honda’s Stride Walking Assist and the ReWalk, the Kickstart from Cadence Biomedical is designed to help improve the gait of people who have difficulty walking and help them regain their mobility and independence. But unlike its robotic cousins that are powered by weighty rechargeable batteries, the Kickstart is able to ditch the batteries altogether because it has no motors to power. Instead, it is purely mechanical and provides assistance by storing and releasing kinetic energy generated by a person when walking. Taking inspiration from the highly efficient walking and running technique of horses that is enabled by long tendons spanning multiple joints, the Kickstart uses natural spring tension to capture kinetic energy and release it to assist the hip flexor muscles that are used to pull the knee upward when walking. Available in one- or two-leg configurations, the Kickstart is designed to be worn on the outside of a person’s clothing. 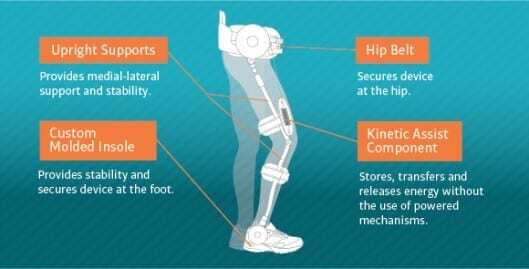 It consists of a hip belt, two structural supports (one from the hip to the knee and another from the knee to the ankle), a custom molded insole to securely attach the device at the foot, and a kinetic assist component positioned just above the knee. When the leg (or legs) on which the Kickstart is attached is planted on the ground and the other leg is swung forward, a spring on the Kickstart’s kinetic assist component is stretched, storing the kinetic energy. Then, when the person raises this leg, the energy from the spring is released, helping lift the leg and propel it forward. The device is aimed at patients with lower extremity weakness, secondary to neurological injury or disease such as stroke, incomplete spinal cord injury, ALS, muscular dystrophy and multiple sclerosis, whose levels of function have plateaued in therapy.